This game will make you cry, but in a good way. Before we get into what I think about Bloodborne, let me preface this by saying that I am by no means a veteran of the “Souls” (Demons, Dark, and Dark 2) franchise. In fact, prior to Bloodborne, I have never even played one of these. I have had friends tell me of their frustration and how unforgiving the games could be. I thought I knew what I was getting into, and yet I was still so, so wrong. Unfortunately, with this being my first venture into one of these games, I will not be able to explain the differences between Bloodborne and its Souls brothers (of which I’m told there are many). What I can tell you, though, is what will come as no surprise to any who have played one of these games: Bloodborne is HARD. Like, really hard. There were many times during my first couple of hours (hours that were spent in the games first area, might I add) that I felt the strong urge to throw my controller at the nearest wall and burn everything down. The game is unforgiving right from the start, when it drops you into the harsh world of Yharnham, filled to the brim with village people that have been transformed into violent and terrifying monsters. If you see this many people, just say a quick prayer. The very little of Dark Souls (and Dark Souls II) that I was exposed to showed off hulking, armor clad warriors with swords and shields slowly and methodically making their way through rooms and ridding them of the monsters within. What you’ll see in Bloodborne is quite possibly the polar opposite. Those who timidly approach enemies are not welcome in this game. Combat is fast and chaotic, and you will often find yourself rolling around enemies as they try to hack you to pieces. One of the Souls franchise’s greatest accomplishments was its sense of community. While some people enjoyed jumping into others’ games and offering them nothing but trolling, the majority of the community came together to not only find and share secrets with other players, but help uncover what’s really going on in the games. 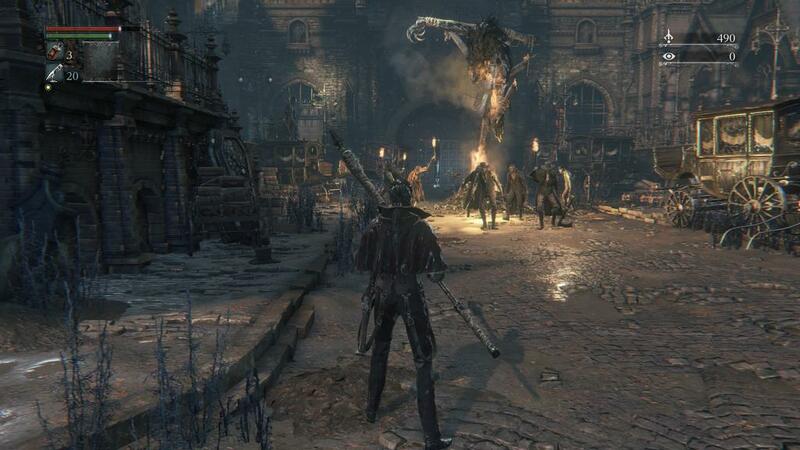 Bloodborne will be no different, I’m sure, but as of now there is still an air of mystery about the game. During my time playing, I was often in offline mode, which meant that I had no guidance from players and was left to my own devices. I’m sure that in the coming weeks, this will change and the game will be teeming with messages from other players to warn them of dangers or help them find secrets, but I must admit I enjoyed the serenity of playing alone. I don’t want to spoil many of the game’s surprises for you, but just know that it punishes you (intentionally) at every turn and isn’t very apologetic about it. Enemies often jump out of random corners, and juuuust when you think you’ve made it out alive, another one will spring out and make you yell things you didn’t even think possible. 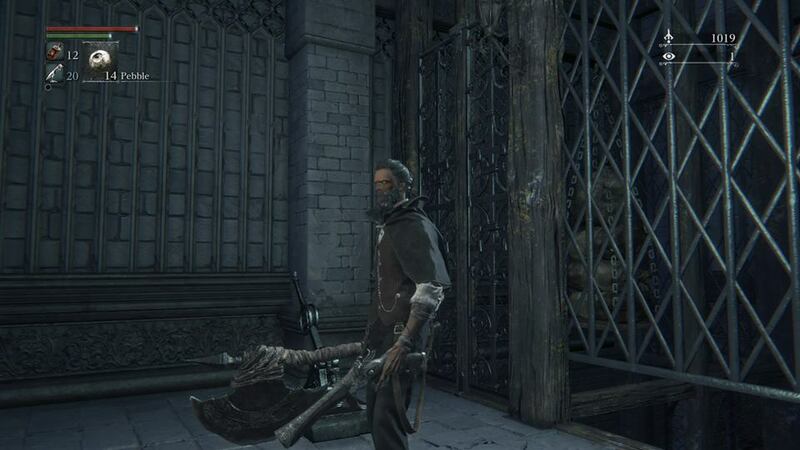 When it comes to additions, Bloodborne gives you something many people might think is a gift: a gun! “Yes!,” you might be thinking, “now I can just shoot whatever enemy comes after me!” Should that be your train of thought, then you are in for a world of surprise since gun do not deal much damage. However, the guns in Bloodborne (the Pistol and Blunderbuss to start) aren’t useless. They serve a vital purpose. My old man character, gun and pebbles in hand. When you’re fighting the various creatures you encounter, you’re going to need every advantage that you can get, and the guns offer a strong one. Timing your shot right during an enemy’s attack will cause it to stagger, allowing you a small window to sneak in a super attack and deal some serious damage. This may not seem like much, but when death is such a common occurrence, any sort of advantage is welcome. Speaking of death, it is everywhere. There’s not much you can do about it. No matter what, it is going to happen. In Bloodborne, however, this isn’t necessarily a bad thing. While you do lose your Blood Echoes (the currency for which you will upgrade things) when you die, it doesn’t take much to get it back (just go back to your death spot and claim them). The silver lining of death in Bloodborne is where the game gets truly interesting. Strategy plays a surprisingly large role in this game because when you die, it normally means that whatever means of attack you were employing was not good enough, and it’s time to go back to the drawing board. If being a run n’ gun maniac isn’t working (it’s probably not), you might want to take a slightly more cautious approach. I’ve found myself rethinking a lot of my choices whenever a giant, wolf, crow, or boss sent me back to the Hunter’s Dream. I hate you, Cleric Beast. I hate you so much. Trial and error doesn’t go unrewarded though. Bloodborne is a game that rewards those who dedicate enough time to becoming skillful at it. You can’t just luck your way into beating this, and given enough time, what might give you trouble initially will turn into something you can do in your sleep. That’s where the game really shines. 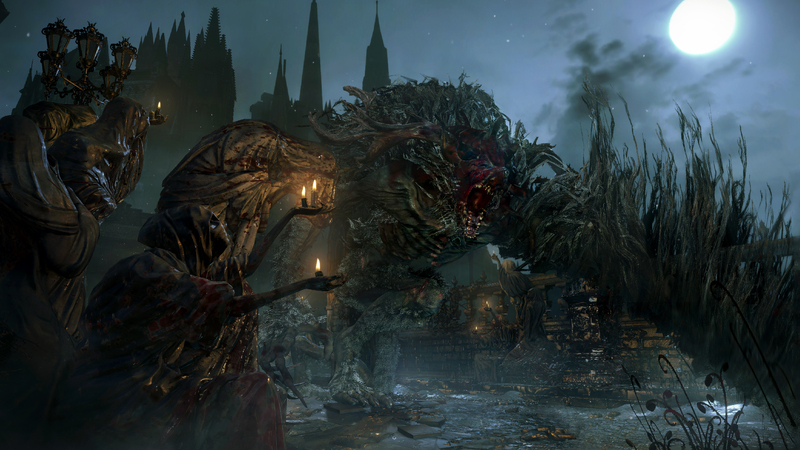 You’ll never be truly great at Bloodborne, and it doesn’t seem to matter at a certain point. The strive for better weapons, higher rated gear, and the thrill of beating a boss, is enough to keep me wanting to go back even as I stop to write this article. I’ve already expressed how tough Bloodborne is, and it’s not an exaggeration; the game is brutal. I don’t think I’ve played a game harder than this one, and I’m someone who prides himself on playing games meant to make you angry (I’ve already expressed my love of Super Meat Boy and N+). Bloodborne is a different beast altogether, though. Getting through an area or defeating a boss is a thrill seldom experienced in video games nowadays. It may not seem like it when you’re on the 35th attempt at a fight, but you are going to feel damn near invincible once you finally get the job done. It’s games like these that often feel the most rewarding to play, and I’m not beating myself up for never jumping into these worlds before. Load times are insanely long. I believe From Software is working on a patch, but for now there is a very distinct long load time. Frame rate has yet to be an issue for me, and the game itself (especially the enemies) is extremely gorgeous. I’m sure Charles Singletary Jr., who is doing the full review, will touch more on PvP and the dungeons, but I have yet to experience either. As it stands, I think the game is amazing, and that everyone should at least give it a chance. We will be covering this game as thoroughly as possible in the weeks to come, and Charles will be posting his review once he manages to finish it. In the meantime, I suggest you all challenge yourself to pick up an axe and go hunting.